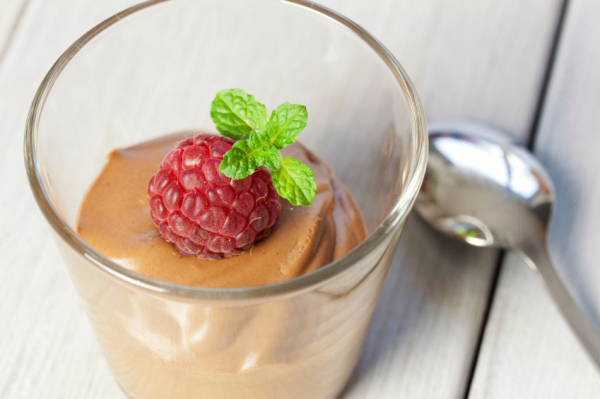 Get your post-workout nutrition needs met with this delicious chocolate protein cheesecake recipe. It’s bursting with taste, protein, and clean carbohydrates. You’ve just crushed it in the gym. After an hour-long session of heavy lifting, your body’s craving food. Instead of reaching for something sugary and sweet, grab a slice of my post-workout chocolate protein cheesecake. Yep, you read that right! This chocolate protein cheesecake is so jam-packed with nutrients, wholesome ingredients, and delicious taste that it’ll make you ditch your shake. From the cocoa powder that’s been shown to have a positive effect on insulin sensitivity to the phytonutrient-packed berries, this cake’s the real deal. Your post-workout nutrition will never be the same. 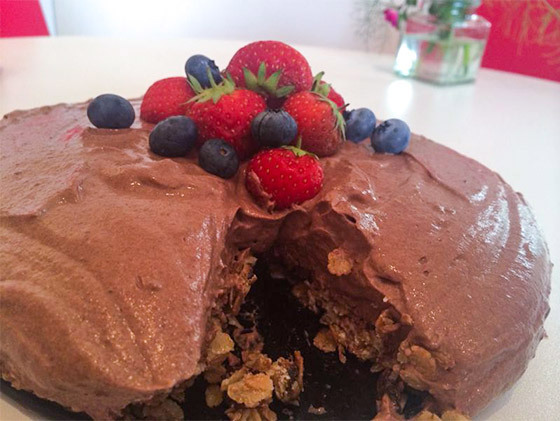 FROM THE COCOA POWDER THAT’S BEEN SHOWN TO HAVE A POSITIVE EFFECT ON INSULIN SENSITIVITY TO THE PHYTONUTRIENT-PACKED BERRIES, THIS CAKE’S THE REAL DEAL. According to research published in the “Canadian Journal of Applied Physiology,” the body’s rate of muscle protein synthesis (MPS) is elevated by 50 percent for four hours following a bout of heavy resistance training. Getting protein into your body during this time is critical to maximize growth and repair. It’s for this exact reason that my cheesecake boasts an impressive 139 grams of protein. Research has also shown that glycogen synthesis can be accelerated by increasing your carbohydrate intake. This means that the rate at which the body’s muscle glycogen stores are replenished can be enhanced by increasing your post-workout carb intake. This cake tastes decadent, but it’s also been formulated to increase the rate at which your muscles repair and grow. What more could you want? The thick-and-creamy protein topping will draw you in, while the macro-meeting goodness of slow-digesting muesli and berries will keep you full. Add gelatin to water. If using powder, 1 tsp is the equivalent to 1 packet/leaf of gelatine. In a bowl, mix the milk and cocoa. Add the gelatin. In a large separate bowl, mix the yogurt, whey protein, quark and vanilla extract. Mix until smooth. 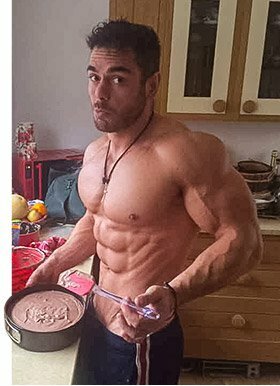 Add milk, cocoa, and gelatin mixture to the yogurt, whey protein, quark, and vanilla extract mixture. In separate bowl, whisk egg whites. Slowly fold eggs whites into quark mixture. Carefully add the strawberries and blueberries to the mixture. Heat coconut oil and honey until melted. Stir in muesli until fully coated with oil and honey. Place mixture in springform tin. Gently press the mixture into place so it’s even and compact. When cooled, gently spread topping mixture on top. Fold in the egg whites for a light, fluffy texture. Place in fridge for at least 4 hours or until the entire cheesecake is set and the top is firm.